Columbus Day, once considered a major event, has been undergoing a decline in recent years. Its parades have met with protests and some have been deemphasized or outright eliminated. In California, Columbus Day became Indigenous People's Day, which sounds vaguely like a Marxist terrorist group's holiday. But while it's tempting to put that down to California's political correctness, in South Dakota, it was renamed Native American Day. No American state has followed Venezuela's lead in renaming it Día de la Resistencia Indígena, or Day of Indigenous Resistance, which actually is a Marxist terrorist group's holiday, the whole notion of celebrating the discovery of America has come to be seen as somehow shameful and worst of all, politically incorrect. Anti-Columbus Day protests are mounted by La Raza, whose members, despite their indigenous posturing, are actually mostly descended from Spanish colonists, but who know that most American liberals are too confused to rationally frame an objection to a protest by any minority group. About the only thing sillier than a group of people emphasizing their collective identity as a Spanish speaking people, and denouncing Columbus as an imperialist exploiter is the prevalence of "white" aborigines in Australian academia who make Ward Churchill look tan. The absurdity of these attacks is only deepened by the linguistic and cultural ties between the Italian marchers and the Latino protesters, but while the former are being honest about their cultural origins, the latter are cynically exploiting white guilt to pretend that being the descendants of Southern European colonists makes them a minority. If being descended from Southern Europeans makes you a minority, then Columbus, the parade marchers, the Greek restaurant owner nearby and even Rush Limbaugh are all "people of color." Italian-Americans are the only bulwark against political correctness still keeping Columbus on the calendar, and that has made mayors and governors in cities and states with large Italian-American communities wary of tossing the great explorer completely overboard. But while Ferdinand and Isabella may have brought Columbus back in chains, modern day political correctness has banished him to the darkened dungeon of non-personhood, erasing him from history and replacing him with a note reading, "I'm Sorry We Ever Landed Here." If Columbus is to be stricken from the history books in favor of ideological thugs like Malcolm X or Caesar Chavez, then America must soon follow. Columbus' crime is that he enabled European settlement of the continent. If the settlement of non-Indians in North America is illegitimate, then any national state they created is also illegitimate. It is easier to hack away at a nation's soul by beginning with the lower branches. Columbus is an easier target than America itself, though groups like La Raza consider both colonialist and illegitimate. Americans are less likely to protest over the slow banishing of Columbus to the politically correct Gulag of history, than over banishing America itself, which was named after another one of those colonialist explorers, Amerigo Vespucci. First they came for Columbus Day and then for the Fourth of July. The battles being fought over Columbus Day foreshadow the battles that will one day be fought over the Fourth of July. And as Columbus Day joins the list of banned holidays in more and more cities and states across the country, one day there may not be a Fourth of July, just a day to remember the atrocities of the colonists against the indigenous inhabitants of the continent, to be remembered with PBS documentaries comparing George Washington to Hitler and calling the Declaration of Independence a colonialist mandate. Such documentaries already exist, they just haven't gone mainstream. Yet. We celebrate Columbus Day and the Fourth of July because history is written by the winners. Had the Aztecs, the Mayans or the Iroquois Confederation developed the necessary technology, skills and motivation to cross the Atlantic and begin colonizing Europe, the fate of its native inhabitants would have doubtlessly been just far uglier. The different perspectives on history often depend on which side you happen to be on. To Americans, the Alamo is a shining moment of heroism. To the Mexicans who the heirs of a colonialist empire far more ruthless than anything to be found north of the Rio Grande, the war was a plot to conquer Mexican territory. And neither side is altogether wrong, but choosing which version of history to go by is the difference between whether you are an American or a Mexican. A nation's mythology, its paragons and heroes, its founding legends and great deeds, are its soul. To replace them with another culture's perspective on its history is to kill that soul. That is the ultimate goal of political correctness, to kill America's soul. To stick George Washington, Patrick Henry, Jefferson, John Smith, James Bowie, Paul Revere, Alexander Hamilton, John Adams, Benjamin Franklin and all the rest on a shelf in a back room somewhere, and replace them with timelier liberal heroes. Move over Washington, Caesar Chavez needs this space. No more American heroes need apply. Followed of course by no more America. This is how it all begins. And that is how it ends. Nations are not only destroyed by atomic bombs or economic catastrophes, they are lost when they lose any reason to go on living. When they no longer have enough pride to go on fighting to survive. The final note of politically correct lunacy comes from a headline in the Columbus Dispatch about the Columbus Day festival in the city of Columbus, Ohio. "Italian Festival honors controversial explorer with its own Columbus Day parade". Once the great discover of America, Columbus is now called "controversial" by a newspaper named after him, in a city named after him. Can the day when USA Today has a headline reading, "Some cities still plan controversial 4th of July celebration of American independence" be far behind? "Italian-Americans are the only bulwark against political correctness still keeping Columbus on the calendar"
You betcha:) We still have parades, wish each other a happy Columbus Day, and the Italian flag does fly along with the American and Canadian flags on the Fourth of July as the colors of the day. Not that Canada has anything to do with the discovery of America. Happy Columbus Day! It is still a holiday that merits a holiday greeting from one American to another American. The Indians are not 'indigenous' at all. They are Mongols and some even think some of them are Amorites as they are plainly not all the same people. Secondly there are many graves of Caucasians,a very tall people, who predate those indians by a long long time. They have no explanation about that, however. Indians also cannot 'splain why the Incans and Mayans and etc. told the Spanish that they did NOT build the "ruins" but that those buildings were there when they arrived! Yes, they were ruins when the Spanish arrived and the Incans and Aztecs and Mayans did NOT build them. Columbus' crew had tons of Sephardim . Yay!!!! And he may well have been one himself. Double Yay. God Bless Cristoforo Columbo a truly great man. I love Columbus Day and glad he discovered America for us all. To hell with what California and South Dakota have to say.They are loser states anyway. I say the Indians are the only real people on earth.All the earth was stolen from us by the white man who always spoke with a forked tongue. Before the white devil came we had the one true religion. We practiced human sacrifice and had tribal warfare that showed us as true men who could count coup and take what we desired. When the white man came all that ended and now we can't do that anymore. Where is our freedom of religion? Aztec religion filled wells with sacrificed women and children in those old days and the weather remained real good because of it. Now it is hot and humid all the time. We primed people up before ripping out their hearts in sacrifices to the great god. Now we can only be wimpy protestants who put money on a collection plate like wusses. This is all the fault of the white man. We are poor because of the white man who stole our animals and rotted all the trees away. I second that double yay Lemon! OT but I found it interesting. People tell me I can't be Italian because I am too light skinned even though a maternal surname puts and my mother's relatives puts us in the Bari region of southern Italy and first hand info from my mother's aunt. There were apparently a lot of Jews in Bari, too. "The names of scholars who taught at the local rabbinical academy in the tenth and eleventh centuries are recorded, including Moses Calfo, who is mentioned in the Arukh of *Nathan b. Jehiel. Legend talks of "four rabbis," who sailed from Bari in 972, were captured at sea by Saracen raiders, and sold into slavery in Spain and North Africa; after being ransomed, they founded famous talmudic academies (see *Moses b. Hanokh). The legend at least indicates that Bari was known as a center of talmudic learning. This is confirmed by the adage cited by Rabbenu *Tam in the 12th century: "From Bari shall go forth the Law and the word of the Lord from Otranto" (a paraphrase of Isa. 2:3). The Jews of Bari underwent a number of vicissitudes. They were included in the edicts of forced conversion issued by the Byzantine emperors in the ninth and tenth centuries (see *anusim)." Interesting reading and I bet those protesting against Columbus Day do so having taken full advantage of the advances in medical science and technology created by the "colonizers". I believe what we're seeing is an attempt to make the world weissrein and judenrein. Every other race is allowed its identity, culture and traditions except whites and jews. And it's our own people who have betrayed us. To all true Americans, I wish you a Happy Columbus Day, celebrate it loud and proud! Without agreeing with any of the garbage that the current leftists put out, may I point out that the ruins that the Mayans and certainly the Aztecs were referring to were built by the Olmecs, who were the first major civilization in Meso-America. We've had this little discussion before and while you learned a few things last time, you still have missed the basics. Columbus Day and Christopher Columbus had nothing to do with the discovery of North America and it's descendents in Canada and the United States. He didn't land anywhere near North America and since he didn't have anything to do with discovering it, why should we celebrate him? To be precise, he didn't even have anything to do with the discovery of the Americas at all. When he found new land to the West and charted a route to it, he didn't know that he had discovered a new continent. He thought he had found a new route to the East. Christopher Columbus's dramatic error is why we call "Native Americans" "Indians". He thought the people he found were eastern natives of India, which is where he was trying to go in sailing West accross the Atlantic. 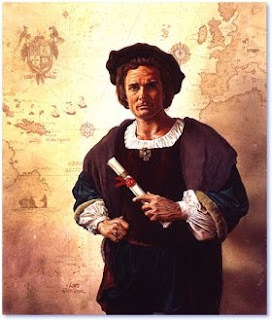 Christopher Columbus's best contribution to human history is that he demonstrated navigationally that the world was round and brought back documentation to allow others to duplicate his efforts. Our myth of the New World that we celebrate in the US is better understood to be Thanksgiving. And it is a better reflection of the history of the peoples who founded the United States and their relationship with the natives they found there. The people who came from England to live in North America were weak and helpless and needed aid from the natives to survive and they were grateful. Jamestown didn't make it, their effort was erased from history. Columbus Day is better observed by the peoples of South and Central America and if they don't like him, that's no reflection on the people of the United States or its history. He's their daddy, if it hadn't been for him there would be no Hispanic culture. Life for them would be completely different. It's very telling that peoples who can't seem to govern themselves without corruption, build great empires, keep from fighting each other over the silliest things, cast off the caste system completely and contribute in a broad and meaningful way to science and technology are constantly trying to tear down peoples who can. Columbus had nothing to do with discovering North America? Is this an argument you're seriously making. Henry Hudson didn't physically walk across all of Hudson County, I suppose it was a mistake to name all that after him too. Thanksgiving is one holiday, Columbus Day is another. Your description of it as helpless settlers who couldn't survive without Indian help is a big part of the problem with that PC gloss of Thanksgiving. For the most part that was not the case. Columbus Day celebrates ambition, discovery and the achievement of exploration. And those are qualities we need to celebrate and remember. "Columbus Day celebrates ambition, discovery and the achievement of exploration. And those are qualities we need to celebrate and remember." That's great, but why should we worry about losing it as if it were the Fourth of July? That's just ridiculous. If you want to celebrate Christopher Columbus, you should at least have a basic grasp of what he did and why. He discovered the New World by accident. He had no idea it was here and even after he found it, he didn't understand what it was. It doesn't matter, his was a remarkable achievement in intellectual and physical courage and leadership. He deserves to be remembered and respected, but his achievements were only marginal to the history of the US. We have our own explorers without which we could not have become the United States, maybe we should remember them too. Sure, those who denigrate Columbus Day are idiots. But you have to get it right to put them in their place. Celebrating Columbus is the celebration of the discovery of America. Arguing over Columbus' exact purpose is irrelevant. Otherwise you can dismiss Alexander Fleming just as easily. Discovery is a journey and it doesn't always take you where you expect to go. That's the point. If it wasn't for European intervention, the indigenous peoples of the New World would have gone with their traditions of ruining the eco-systems and environment for their own selfish needs and trying to exterminate each other with vigor! Thank God Columbus landed and the European hordes that followed put an end to native-on-native attempts at genocide and habitat destruction by lazy hunter-gatherers. Congratulations to Capt Columbo and his fine crew for a job well done. Darden Restaurants takes down the American Flag at their restaurants because.....it would "disrupt your eating experience". We are not making this stuff up folks. It is true. Read the article below. That being stated, it is now our turn to tell Darden Restaurants that the American dollar bill also has some meaning to it and we will not be eating at any of the following Darden ownded restaurants. Contact Darden Restaurants and let them know that the American Flag goes where you go! They also serve halal food at some restaurants as does Subway. Al Jezera (sp?) did a special on Indian tribes and their history.It destroys all our historical facts based on: Indian testimonies ,a book by the plagiarist Ward Churchill and a book about S.America that they use as N.American facts. The summary of the "documentary" was white European invaders committed genocide of the 80-120 million native residents of America .